"Just a brief description on what i do. I work for an auto auction inspecting vehicles.The deparment i work for handles goverment siezed vehicles, Repos, and illigally imported cars. 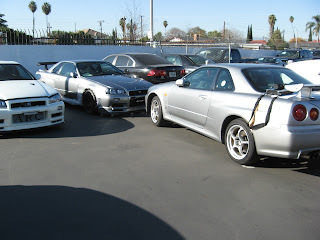 Today we recieved three R34 GTR's and a S15 Silvia that were siezed from a few contianers down at the port. The owner must be furious, I think any one would be , especially if your a car enthusist like myself. Anyways i wanted to share on what usaully goes on a normal day of work. Enjoy the pics"
If I were the owner I'd be doubly furious for a retarded tow truck driver towing an AWD car with the rear wheels on the ground and destroying the center differential. 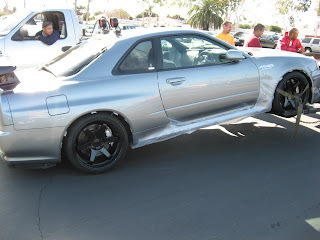 A saw an STI being towed this way shortly after they came out and just had to shake my head. 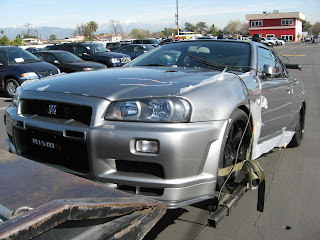 Whats wrong with you, towing a r34 it just makes me sad, people why do this to such an amassing car thats just wrong. Thats not me. Thats a quote from someone on the NICO forums. Thats the wrong way to tow an all wheel drive car. The wrong way. I don't know what happened to these cars. Pretty sure the tow truck driver doesn't care nor does anyone else. These cars are going to be crushed so who cares about damage to the centre diff. Don't worry about the differential this car is getting crushed!